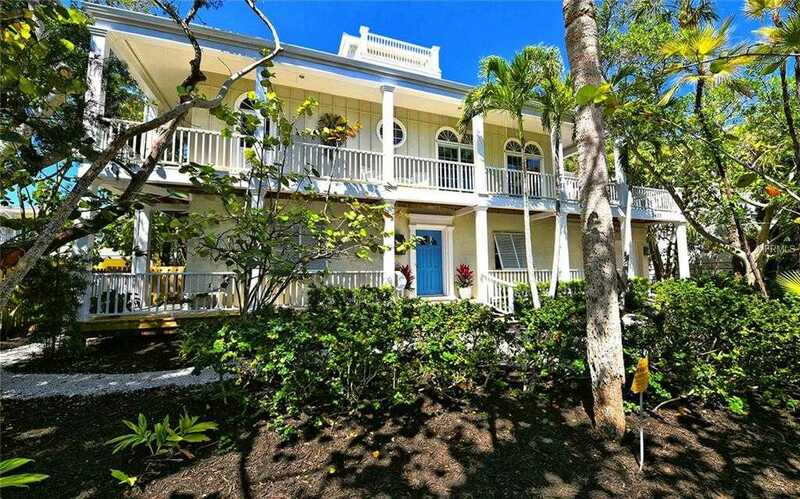 Classic Key West-style residence on the north end of Siesta Key. Tucked away on Bay Island, between Sarasota 8217;s mainland and the north end of Siesta Key, the location can 8217;t be beat. Super close to Shell Beach, Bay Island Park, and a short distance to Siesta Key Beach, Siesta Village and Downtown Sarasota. Supreme privacy, wrap-around balconies, working cupola with platform leading to rooftop lookout, and extra-large fenced backyard endow this Sarasota island home with a delightful sense of wonder. The open floor plan features high ceilings and sliding glass doors taking advantage of the natural Florida light. The flexible living area with wood-burning fireplace can be configured to your heart 8217;s desire. The spacious kitchen has granite countertops with plenty of work space for multiple cooks and adjoins a sunny breakfast room with access to the open balcony. This home 8217;s elevated layout has all living areas on the second floor along with the master retreat which features two walk-in closets, built-in library and ensuite bath. The rest of the bedrooms are on the first floor along with a large bonus room with desk and storage built ins. The large, fenced-in backyard adds to the wow factor of this exquisite home. At 104-ft. x 42-ft., there is plenty of space for your favorite at-home outdoor activities. Privacy, style, location – welcome home to laid-back island living. Pool photo is landscape architect 8217;s conceptual rendering. Please, send me more information on this property: MLS# A4431863 – $899,000 – 3400 Hamilton Ave, Sarasota, FL 34242. I would like to schedule a showing appointment for this property: MLS# A4431863 – $899,000 – 3400 Hamilton Ave, Sarasota, FL 34242.